Everyone is gifted in some way. Our genetic endowment as human beings and the specific geneswe have inherited puts at our disposal a wealth of skills and talents. These talents we were born with need to be developed and other skills need to be acquired through our lives. This is what the Skills Card is telling us. At the current state of our lives we need to practice and develop latent skills and learn new ones. Should we book and education course to sharpen up some of the neglected arrows in our quiver? Should one by a book to enhance knowledge of a new interest? The message is to extend and sharpen ourselves. 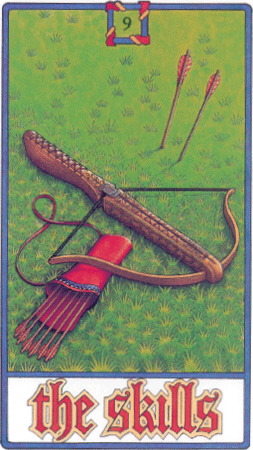 The card stands for Self Development and the long journey of personal growth.